Online supermarket Picnic continues to expand: Starting in late February, consumers in Krefeld will also benefit from its low prices and free delivery. Already, all those in Krefeld can register on the Picnic app waiting list. "For us, Krefeld is the logical next step," says Frederic Knaudt from the German Picnic team. "Picnic does not only inspire existing customers - the advantages are quickly becoming apparent in neighboring cities as well. Especially from Krefeld we had very many inquiries. Our hubs in Neuss and Mönchengladbach have grown rapidly. In both cities, we have gained valuable experience and we were able to adapt our services even more to the needs of local consumers. Krefeld marks the beginning of even faster expansion in Germany for Picnic." 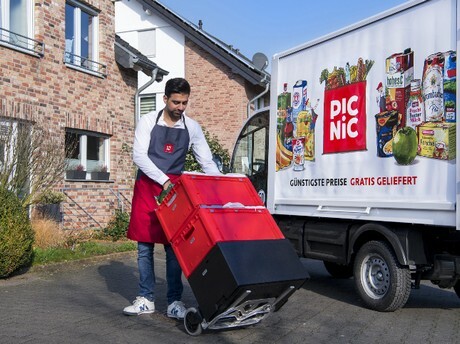 "Picnic opened its first German hubs in Neuss and Mönchengladbach in 2018. It now supplies around 15,000 customers in Neuss, Kaarst, Meerbusch, Mönchengladbach and Düsseldorf-Oberkassel. The Krefeld hub will be set up in the centrally located Mies van der Rohe Business Park, especially tailored to the logistic requirements of Picnic. From here, the first 15 electric vans will deliver foodstuffs and everyday products quickly and fresh directly to the customers in the new delivery area. Picnic offers its registered customers a full range of food and store items at very reasonable prices. In addition to Edeka Rhein-Ruhr, there are many regional farms, butchers and bakeries among its suppliers. Deliveries are done daily, Mondays to Saturdays, without delivery charges from an order value of €25 or more. Orders can be conveniently placed until 10pm via the Picnic app, to arrive the next day. A 20-minute delivery window will always be provided and the exact route of the delivery vehicle can be tracked in real time via the app. The excellent service and friendliness of the Picnic runners in their milkman aprons have often been highlighted by the customers. The company attaches great importance to sustainability. Therefore, the customer deliveries are done exclusively with electric vehicles, which have a small impact on road traffic and do not have parking problems. The exact product quantities ordered pre-empts food waste. From the new hub, Picnic will be able to reach 100,000 households. The company currently employs around 300 people in North Rhine-Westphalia.